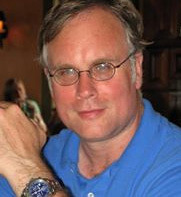 John Robison will be participating in the Memoir panel. He was interviewed by Kate Hartford, who has edited the interview for length. For more about his book SWITCHED ON: A MEMOIR OF BRAIN CHANGE AND EMOTIONAL AWAKENING, see excerpts from NPR’s Fresh Air interview of John and Alvaro Pascual-Leone by Terry Gross on the research in transcranial magnetic stimulation (TMS) that formed the basis for the book. I don’t think that I would say that the writing bug bit me. I have always communicated my ideas through written words. As an autistic person, I have often been disabled in my ability to engage people face to face because of my limitations [in] reading body language [or] expressions and my unexpected responses to other people’s language. But in the area of written communications, having practiced it for a long time, my ability is the opposite of disabled. It’s far better than the average person’s. For me, communicating in written form is simply maximizing what you’re good at, and minimizing your disabilities, not a bug at all. When I was in my thirties, I began to feel like I should try and give something back for younger people who were coming along, like me, who had had bad childhoods. At first, I started talking to young people about growing up in bad circumstances. Then when I learned that I was autistic, which was when I was forty years old, for the first time in my life I had a nonjudgmental explanation for why I was this way. I realized there were millions of other young people just like me. And I began talking about that. So that generated such a tremendous response, that I thought well there must be people that would be benefiting from this message all over, not just in Western Massachusetts. My brother [Augusten Burroughs] had written a story about our lives, RUNNING WITH SCISSORS, that had turned out to be a fairly big hit, and I would go to events when my brother was around here, and a great many of the questions were people asking what about the autistic brother – who was, of course, me. I decided that I should write my story in book form, rather than just telling the people in local elementary schools and such. LOOK ME IN THE EYE was the first effort I ever made to write a book. That’s what it sprang from, it was just a realization that there were a great many people who would be likely to benefit from the story about an autistic person who grew up and did okay because so many of the books about autism are frankly really bleak and clinical and depressing. And I thought that an autistic person should be able to tell a better story than that. LOOK ME IN THE EYE was really meant as an entertaining life story that illustrated the life of an autistic person, but people very quickly took it to be a book about autism, to be like a guide about autism, not a memoir – and it really was never that. And that’s what prompted me to write BE DIFFERENT, which is a guide for autism. I never tried to write books before doing those, so that was something I came to late in life, but I had been practicing writing in the context of my cars and such for quite a long time before that. I just write things when they need to be written. There’s a constant demand on me to write things. Today I’m writing accounts of the automotive projects that are in our shop. I have an idea that I should write an article about how they might change ADA therapy for autism, because I saw that that was a very contentious topic at the federal autism meeting last week, and people have been commenting on it still on Twitter and such to me. So, I see things that need writing, whether for work or for autism advocacy or whatever, and I write them. That’s not all I’m engaged in. I’m engaged in photographic art and discussions of photography, and in history and genealogy and other things, and [on] those things, I do communicate with all those people through writing. I also communicate with photographic imagery, but most of the communication is in written words. What are you trying to accomplish as a writer? Well, I started out trying to be successful creating things that would be useful to people, whether those were musical instruments, or restored or repaired cars, or pictures put on billboards or walls, or books that people would read and take some benefit from. I wrote things that were viewed as doing those things successfully. I view [my books or my writing] as having a purpose; they’re not really just to be entertaining. I thought LOOK ME IN THE EYE would be an entertaining story of my life, but specifically to people who were affected by autism. I felt that those people were likely in need of an entertaining story because the stories they had before were very bleak and depressing, and I thought somebody should paint a different picture of life for autism. And that was a very definite purpose; it wasn’t just for fun. I’m not really an artist with these written words; I’m much more of a tradesman. I think that you have people at these writing conferences, those people [who] are aware of subtleties and language and turns of phrase, and so forth. I don’t really have a sense of that, I just think that you have to be able to explain things in a language that people understand. That means that you have to be adept at using common words. Because sometimes I am in government meetings (you know I’m on the autism committee in Washington) and I listen to scientists and government bureaucrats using these complex terms, and I think to myself: I’m an educated person, and I don’t understand what they’re saying. And I’m supposed to be a specialist in this. What is the average person on the street going to make of it? I think they’re going to make of it that it’s gobbledygook. You have to be able to explain any issue that you want to communicate about in a language that will be understandable for 6th graders – if you haven’t done that, I think that you’ve failed in your job as a communicator. A lot of college faculty, a lot of educated people lose sight of that basic truth, that when you use words that people don’t understand, or you use them in ways that people don’t expect, they are not impressed with your language skills; they think you’re a fool, or they just turn away from you. I’ve always had that in mind in communicating, and I think for that reason my stories are simple and direct and easy to understand. Because I’m autistic, there’s not perhaps a lot of subterfuge or fine art in them. I think that some people appreciate that. Other people probably think it’s simplistic and stupid, and that’s okay. But I think that’s the essence of communicating stuff successfully, more than the art of it. It’s got to be told in a straightforward way that anyone understands. What’s the best piece of writing advice you’ve ever received? I’m not really sure what to say to that. My mother [also a writer] and my brother would both say to me: show things with illustrations in writing, not just tell them. So I learned to describe things in scenes, as opposed to just stating the facts. I think that that contributes to storytelling as opposed to logical recital of facts. And it makes it more interesting. You might be asking if there’s some kind of one-line bit of wisdom that people could take away. And I just don’t know that there is. I don’t really think of myself as a writer. I think being a writer is an ability I have that I have to have to practice my trades: I’m a restorer of cars, and an artist with photography, and I’m an advocate for autistic people and people with developmental differences, and I’m successful at doing those things to a significant degree because I can communicate the written words about what I believe in. I’m working on a story about autism in the southwest Pacific, and whether the original navigators who colonized Tahiti, Hawaii, and the other islands were enabled by being autistic, and therefore autism was a key human ability in the colonization of the southwest Pacific. So Hawaiians and Tahitians today owe their ancestry on those islands to the ancestors of the autistic kids that we now see. And I’m working on a story about autism and life in the 17th century in the establishment of British North America. I’m working with a screenwriter at Focus Films on a film adaptation of the SWITCHED ON book. I always have things that I’m writing; I write some thousands of words of stuff of all kinds every week. I don’t at this moment have another book in mind, but my agent and publisher think I’m certainly capable of writing more books. I guess that’s probably true.